Autumn has been wishing away these chilly winter days with thoughts of a warm cozy house and a happy family to play with. She’s a dreamer with a very simple heartfelt desire to be a part of a loving home. Autumn will turn 6 months old in a few short weeks, and has spent much of her puppy youth at the Greenwood County Animal Shelter. Medium-sized and smart as a whip, she has learned lots of fun tricks and games, as well as becoming a wonderful puppy playmate with other dogs. She even tries to play with cats, although some finicky felines may not appreciate her idea of fun. 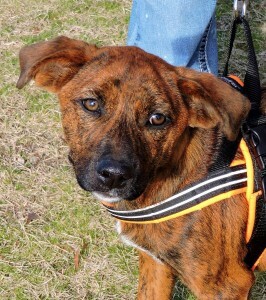 Autumn is a beautiful mix of Plott Hound and Labrador and she has a thick, short red brindle coat. She is very well-mannered on walks and at events and she loves to play with children. Autumn is an eternal optimist and she knows that spring is on its way! With sunny days ahead, the perfect family must be out there looking for a fun pup with all the love in the world to give. Far more than just a pretty face, Poptart is the perfect pick-me-up. 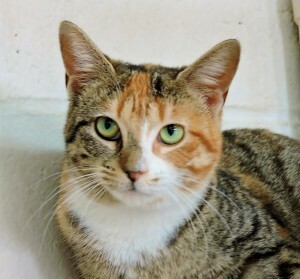 This quiet and demure feline almost seems to blush when you look her way. Her short coat is caught somewhere in between Tabby and Calico, so she sports stripes and splashes of brown, orange, grey, and white. Her eyes glow emerald green and catch the attention of all new visitors. Poptart is a master muffin-maker, always pawing away with delight when people come to see her. It’s impossible to be worried or upset for long with this 1 year old kitty by your side. A few minutes of affection form this beautiful cat and all the stress of the day just melts away with the sound of her soft purr. Poptart is an easy-keeper with good litter box manners and a prim and clean nature. She could snuggle her way into any type of household and seems very fit to be an inside kitty cat. A visit with Poptart may be a great way to start your day, but the lucky family who gets to adopt this little lady has a lifetime of love to look forward to.